A Natural Horsemanship Rope Halter in various colours. 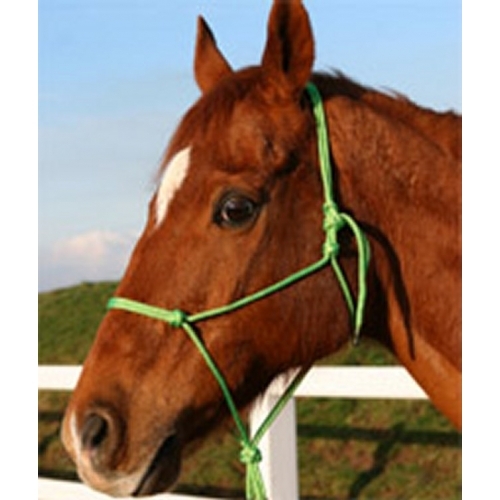 This Low Cost Range of Horseman's Halters are Hand Tied, and the Knots are Balanced in Strategic Places. The Loop for Attaching Lines Hangs below the Jaw and Acts as a Hinge. The Halter is made from Quality, Soft Yachting Rope that Offers the Ultimate in Comfort and Strength and is Ideal for Natural Horsemanship / Parelli Training. Natural Horsemanship Halters are easy to use and excellent value for money! Natural Horsemanship Halter - Made from the Finest Quality Materials but Affordable!